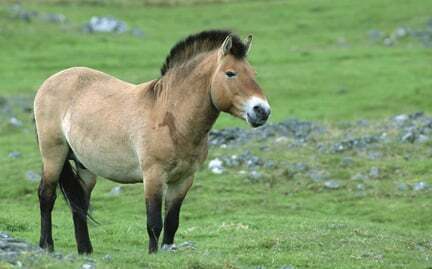 The Przewalski’s Horse was designated as extinct in the wild, but captive breeding programs have reintroduced the horse in Mongolia. The wild horse lives in social groups, consisting of a dominant stallion, a lead mare and other mares and their offspring. Mares, often with a regular partner, groom one another to keep clean and to show affection. Stockier with shorter legs than a domesticated horse, males defend their mares more actively than they defend their territory.